Before there were cameras to document warfare, there were sketchbooks. So imagine then sketching a battlefield and, as smoke filled the air and bullets zipped past, trying to keep your pencil straight. 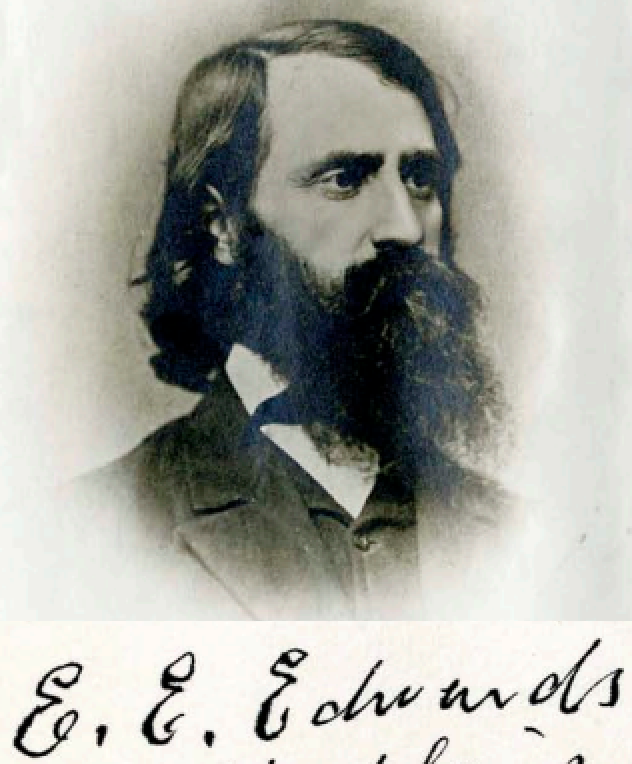 This, though, was the experience of many artists, including Elijah Evan Edwards (1831-1915), who served as chaplain of the 7th Minnesota Infantry during the Civil War (1864-1865). The Minnesota Historical Society has three volumes of Edwards’ journals, including a 1910 typescript he wrote synthesizing his pocket diaries from the war. In it he discusses daily camp life, the people he met, different battles, and so on. 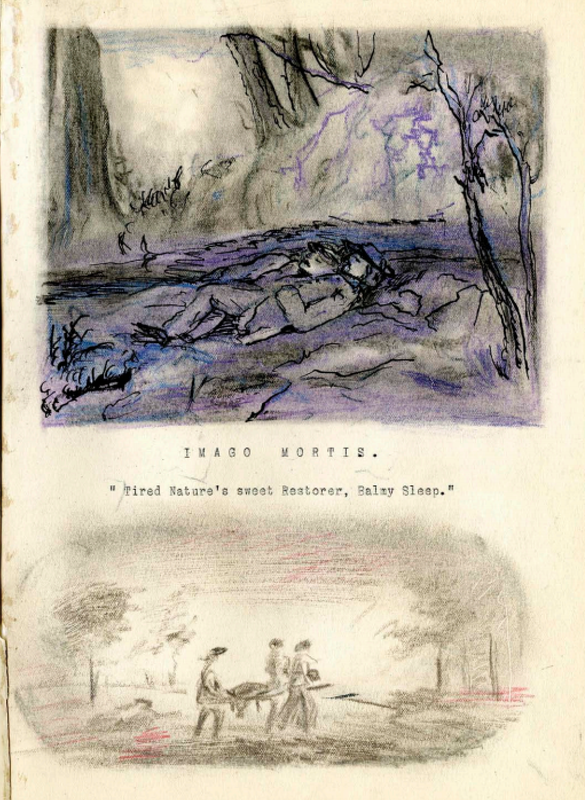 Besides being an invaluable, firsthand account of the Civil War, what makes the text rich is its being accompanied by several dozen sketches made from “hasty outlines finished from memory when I had leisure.” “This is especially true of the battle scenes,” he added, “since I had during the critical moments of the conflict neither leisure nor opportunity to make sketches.” (p.1). It’s these that distinguish Edwards’ written account from others. 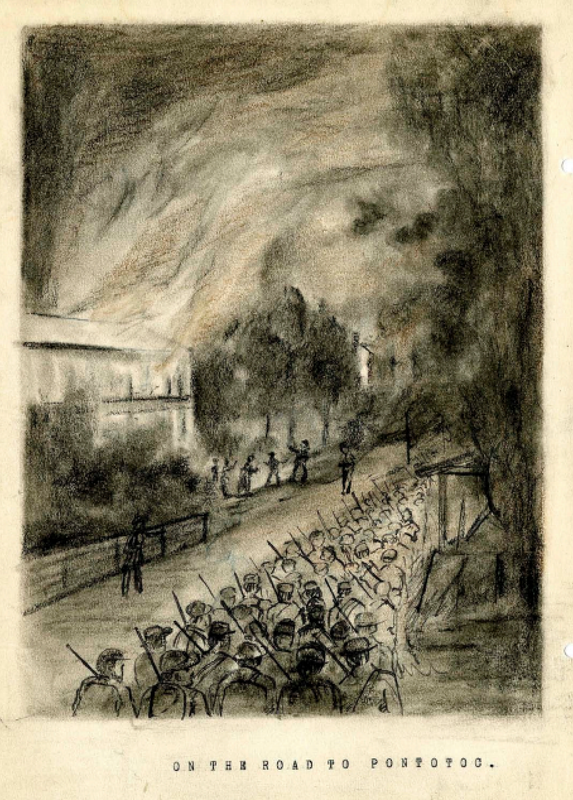 In describing how he made his sketches, he noted that at least a few “were made while under fire, but none to the neglect of any of the duties devolving upon me as Chaplain.” Describing a few such cases, he reflected upon “the difficulties in the way of an ‘artist on the spot’ who attempts to depict war scenes.” (p.1). His art is a dangerous pastime. It will also suggest a reason for the differences between his sketches and those of the professional artist, who immured in his studio paints battle scenes from the descriptions of others aided by the suggestions of his own fervid imagination. (p.2). Conventional ideas of both the artist and the public require battle scenes in which human agents are conspicuous and active. There must be heroes in the fight. There must be martial music, the roar of artillery, the waving of banners, soldiers marching in serried gaily uniformed and keeping exact time as they march. There must be romantic accessories to the scene, or it is no true picture. This ideal is undoubtedly a survival of the old Ossianic and Homeric conceptions of war, and has but little foundations in the conduct of modern warfare. (p.2). Thus, in his writing as well as his sketches, he aspired “to report only what I saw or learned from observers of what I saw myself, and in no case to create or vary from its realism for the sake of effect.” (p.2). 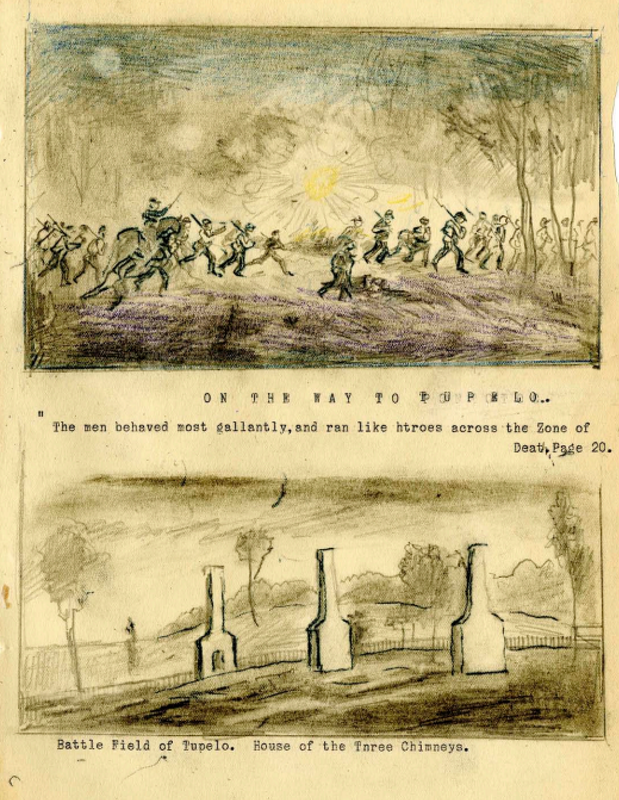 While reading through the typescript, I was drawn to Edwards’ account of the Battle of Tupelo (July 14-15, 1864), a Union victory. After a vivid description of his experience (working primarily with the wounded) he writes of surveying the field and coming upon a Lt. Col. Lewis Hardy. Inspecting him, it was clear the young man was “was mortally wounded and could not be moved.” (p.27-28). So as ambulances and medics passed Edwards asked for their help, being told there was either no room or no hope. Staying with Hardy, as the artillery came up followed closely by Union General Andrew J. Smith, the general looked over Hardy and “answered by a great oath that sounded like an evidence of Grace in heart, saying as he did […] that no brave soldier of his, man or officer, should be left living or dead on the field.” General Smith then halted a nearby artillery wagon and ordered Hardy be fastened to the box–but “by the time we had fastened the Lieutenant to the caisson, he had breathed his last.” (p.28). Riding beside the corpse, when Edwards arrived at camp the unit came together and buried Hardy “near midnight and by torchlight.” As they did so, Edwards made a few sketches in his notebook of the scene as the Confederate artillery “continued shelling our deserted battlefield […] But he was too badly beaten to pursue us any great distance.” (p.28). The next morning the unit rose early and marched on toward Memphis. Although I’ve read several history books about the Civil War, I’ve always been more interested in personal accounts like Edwards’ (i.e. letters, diaries, and journals). While (good) historical writing offers context and analysis and from many particulars draws designs of an era and its influences, it is just one of many ways to engage with history. The reason why I love personal accounts so much is precisely because it lacks these grand schemes and doesn’t hide its quirks, biases, and urgency. It’s this last trait that revives the dead and, for me, humanizes history–that very real, very human obsession to pick up a pen or, in Edwards’ case, sit down at a typewriter and say: I need to tell this story. This piece is captivating. Good job!